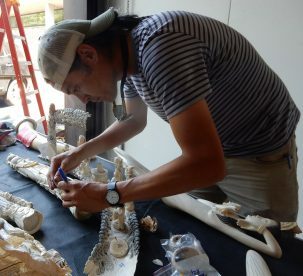 Two weeks ago, Kevin Uno was on a field expedition in Kenya when he got a message he’d been hoping for: the NY Department of Environmental Conservation had officially approved his request to sample some ivory that had been confiscated from retail stores in the U.S. The Lamont-Doherty Earth Observatory geochemist and his colleague, University of Washington research professor Samuel Wasser, use radiocarbon dating and DNA testing to determine when and where an elephant was killed; sampling this recently seized ivory would be an opportunity for them to find out whether it was recently harvested, and help law enforcement target the poachers responsible. The catch? Sampling had to be done before August 3, the following week, when the ivory—2 tons of it, valued at approximately $8 million—would be publicly destroyed at an Ivory Crush in New York’s Central Park. Kevin Uno marks carved tusks for sampling. 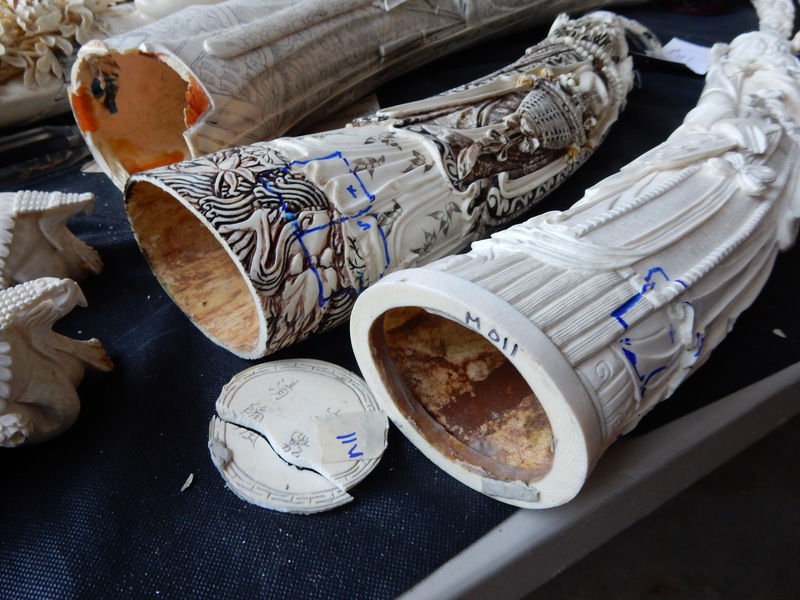 On August 1, Uno, Wasser, and Wild Tomorrow Fund’s John Steward and Wendy Hapgood visited the DEC warehouse, bringing a selection of the confiscated ivory to Lamont-Doherty Earth Observatory. 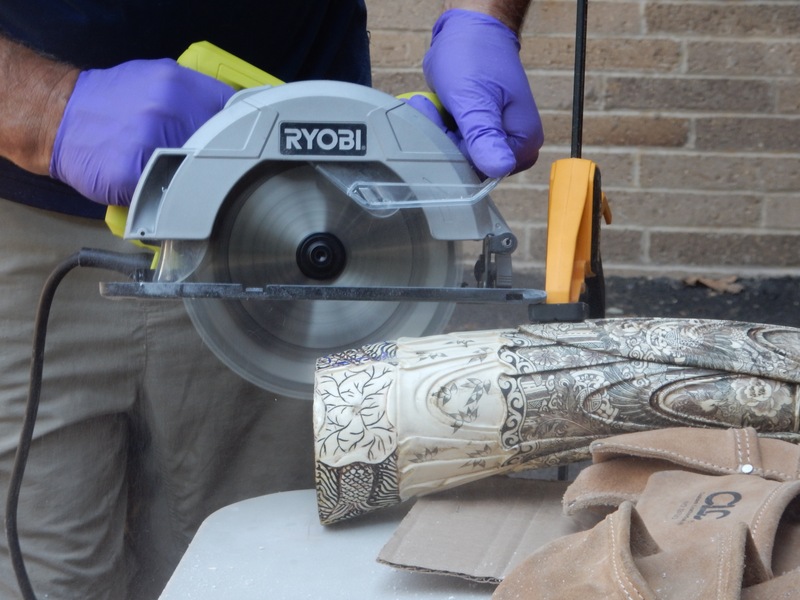 This is the first time that the team has been given permission to sample and test illegally trafficked ivory seized from vendors in the United States; Uno and Wasser have previously sampled ivory seized while in transit from Africa to Asia. Uno developed his radiocarbon dating technique for tusks in a 2013 study published in the Proceedings of the National Academy of Sciences (PNAS). Due to nuclear weapons testing in the 1950’s and 1960’s, the earth’s atmosphere saw a spike in radiocarbon. By isolating the collagen in a tusk sample, then freeze-drying it and running it through an accelerator mass spectrometer, he is able to measure the amount of radiocarbon in the tusk to determine when an elephant was killed, post-1950. Results from a tusk harvested prior to 1950, Wasser clarifies, “are going to look a lot like 1796,” because they lack that spike from weapons testing. Carved tusks, marked for sampling. Wasser cuts samples from a carved tusk. Once their results come in, the team will know exactly when and where that was, then law enforcement can link the tusks to poachers and try to prevent the next crime. This tusk was confiscated during an attempted Craigslist sale. Some experts are concerned that as retail busts become more frequent, online sales will increase. The fight against the illegal ivory trade is multi-faceted. Bans on trade exist by international treaty—CITES, effective as of 1975—and at the country, state and local levels; as of this writing, seven U.S. states have enacted their own bans that tighten national restrictions: New York, New Jersey, California, Hawaii, Oregon, Washington, and Nevada. Along with these efforts to reduce demand, governments in Africa work to cut off the supply by cracking down on poachers on the ground. But demand persists, and the criminal networks trafficking in ivory are advanced. With the opportunity to sample and test more items, more quickly, Uno and Wasser hope to be able to more effectively prevent poaching crimes and hold the perpetrators accountable.